In the book, “Living a Healthy Life With Chronic Conditions”, co-written by Dr. Halstead, the approach is to teach people to manage their chronic disease whether it be heart disease, diabetes, arthritis or asthma. The book includes a nice chart contrasting the different care approaches. The chart has been modified and expanded below. As you can see, the medical system works well for the acute care approach. Our medical model is failing miserably for helping the chronic disease care. 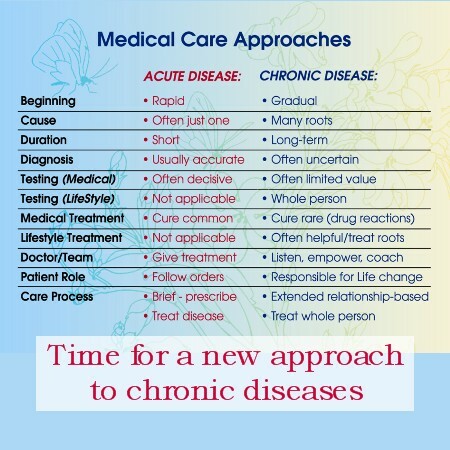 So our medical doctors are left with the option of managing the symptoms of chronic diseases. Their primary treatment of choice for chronic diseases management is medications.